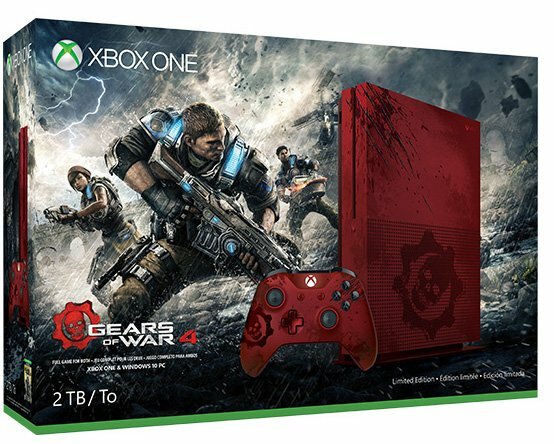 Microsoft has a special Xbox One S bundle coming to celebrate the launch of Gears of War 4. The Gears of War 4 Limited Edition Xbox One S bundle has been leaked ahead of its official reveal. The leak comes from NeoGAF user ekim, who is known to be quite credible with his leaks in the past. The bundle features an all-red console and Xbox One controller, both of which have the Gears of War Crimson Omen slapped onto it in addition to what appears to be blood splatter and dirt. We have a feeling this bundle has seen some stuff. Some terrible, terrible stuff. The Ultimate Edition bundle comes with everything in the Limited Edition bundle, as well as a digital code for Gears of War 4, which will support Microsoft’s Play Anywhere feature. This means you'll be able to play Gears of War 4 on both Xbox One and PC, that is, if you own a PC that's powerful enough to run the game. If you do, then you'll be happy to know cross-platform play will be supported. Pricing for the Limited Edition is still unknown, but it’s believed the Ultimate Edition will be priced at $449. We've reached out to Microsoft for comment and will update our story accordingly. My wife would definitely like my consoles to be uglier. I might have to look in to this.